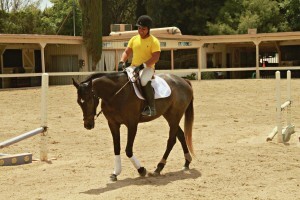 First Job After Graduation: Assistant trainer at Equestrian Centers International in Rancho Mirage, CA. My responsibilities included maintaining show horses for clients, taking horses to shows, teaching riding lessons and organizing lesson schedules. 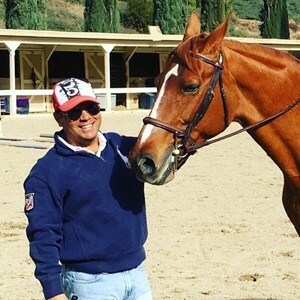 My current position is assistant trainer at Far West Farms, a top west coast hunter/jumper/equitation farm in Calabasas, California. 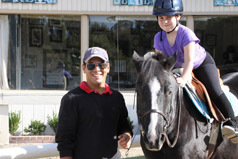 My main duties include riding and schooling horses, as well as teaching lessons. I have to organize my teaching schedule and do evaluations for new students who wish to start lessons. I oversee the care and schooling schedule for the horses and ponies used in the riding program. I go to horse shows when needed to school the horses and coach students too. I also meet with our in house vet regularly and go over what is needed for the horses he is seeing that week. A bit of a jack of all trades. Definitely the friends I made while being there. Some of my best friends I met at MM. After all these years we still keep in regular contact and I am so lucky I met them all because of the Manor. I also had some of the best instructors I could have asked for. Not only did they have great knowledge, but they were great confidence builders. I learned so much - I never thought I would be someone that Olympic and FEI showjumpers and dressage trainers would hire. What makes me so great? Well it was because I learned so much from great trainers at the Manor. I also pushed myself to learn and soak up everything I could. Everything learned can be applied to any riding discipline. Having a great work ethic on top of being a skilled trainer is the icing on the cake to make yourself indispensable to working in the horse industry. I had many experiences at MM that I feel impacted my career in the decade I have worked with horses after the Manor. Crazy to think I graduated almost a decade ago! My riding experiences have been tremendously important. The wide variety of horses I was assigned when a student allowed me to ride whatever has been thrown my way since. I have the reputation at work of getting the horses other trainers can’t ride nearly as well. Some of these are top trainers in the country. They may have a much more high profile show career but, as far as training horses, many I have fixed all because of skills I learned from the Manor and my great instructors. The Manor is great at producing trainers who (should they work hard) have the skills to influence horses and make the horses rideable and enjoyable for their owners. That’s what is important, they are paying you to train their horse. You want to be able to bring something to the table others can’t. Too often we have great show riders but not great trainers. Those lines become blurred very often. Make yourself indispensable! While teaching at the Manor under other certified trainers you develop teaching skills that allow you to teach the student to ride better. Nothing like being thrown into your first job and having to figure it out. However being prepped, having to watch, assist and teach for hundreds of hours was a great preparation for what the real world of teaching is like. I have had several students who, after just a few lessons, felt they took away so much more in those few lessons than they had after riding with others for years. Your skills learned in teaching class brings something that other trainers don’t have. The eye you develop at reading the horse and rider together and your ability to develop sound teaching plans all make a huge impact. Ride as often as possible and ride the biggest variety of horses possible. Work on riding each horse to the best of their ability. Also know you will not walk out of school and be handed a dream job. The first few might not be amazing but they should be great jobs that will allow you to learn and get something respected on a resume. You will have to work hard and put in long hours, it's not an easy career but it is a fun one! More of a lifestyle really. I see people fall out of it all the time because they thought it was something different. It is hard work but nothing is better than a career you enjoy. Another big thing is your attitude. You can be a great rider but with a lazy work ethic you will be passed up. No employer wants someone who is not a team player. Have a great attitude, good work ethic, be a great rider and keep on learning! Those are things that will keep you above the rest. You are never done learning!